Researchers used remote sensing data and topographic modeling techniques to reveal an enormous dome in the Earth's second highest continental plateau driven in part by a huge zone of melted rock in the crust, known as a magma body. About one kilometer (3,300 feet) high and hundreds of miles across, the dome sits right above the largest active magma body on Earth. 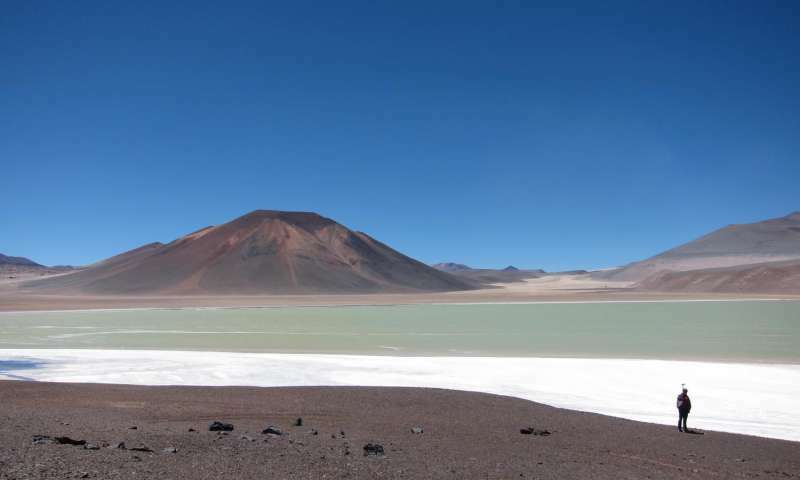 The new analysis of the topography of the central Andes shows the uplifting of the Altiplano-Puna plateau, a high, dry region in the central Andes that includes parts of Argentina, Bolivia, and Chile, with vast plains punctuated by spectacular volcanoes. The uplifting of the dome is the result of the thickening of the crust due to the injection of magma from below, according to Noah Finnegan, associate professor of Earth and planetary sciences at UC Santa Cruz. "The dome is the Earth's response to having this huge low-density magma chamber pumped into the crust," Finnegan said. The uplifting of the dome accounts for about one-fifth of the height of the central Andes, said first author Jonathan Perkins, who led the study as a graduate student at UC Santa Cruz and is now at the U.S. Geological Survey in Menlo Park, Calif.
"It's a large part of the evolution of the Andes that hadn't been quantified before," Perkins said. The other forces uplifting the Andes are tectonic, resulting from the South American continental plate overriding the Nazca oceanic plate. The subduction zone where the Nazca plate dives beneath the western edge of South America is the source of the magma entering the crust and feeding volcanic activity in the region. Water released from the subducting slab of oceanic crust changes the melting temperature of the overlying wedge of mantle rock, causing it to melt and rise into the overriding plate. Perkins and Finnegan worked with researchers at the University of Arizona who had used seismic imaging to reveal the remarkable size and extent of the Altiplano-Puna magma body in a paper published in 2014. That study detected a huge zone of melted material about 11 kilometers thick and 200 kilometers in diameter, much larger than previous estimates. "People had known about the magma body, but it had not been quantified that well," Perkins said. "In the new study, we were able to show a tight spatial coupling between that magma body and this big, kilometer-high dome." Based on their topographic analysis and modeling studies, the researchers calculated the amount of melted material in the magma body, yielding an estimate close to the previous calculation based seismic imaging. "This provides a direct and independent verification of the size and extent of the magma body," Finnegan said. "It shows that you can use topography to learn about deep crustal processes that are hard to quantify, such as the rate of melt production and how much magma was pumped into the crust from below." The Altiplano-Puna Volcanic Complex was one of the most volcanically active places on Earth starting about 10 million years ago, with several super-volcanoes producing massive eruptions and creating a large complex of collapsed calderas in the region. Although no major eruptions have occurred in several thousand years, there are still active volcanoes and geothermal activity in the region. In addition, satellite surveys of surface deformation since the 1990s have shown that uplifting of the surface is continuing to occur at a relatively rapid rate in a few places. At Uturuncu volcano located right in the center of the dome, the uplift is about 1 centimeter (less than half an inch) per year. "We think the ongoing uplift is from the magma body," Perkins said. "The jury is still out on exactly what's causing it, but we don't think it's related to a supervolcano." The growth of the crust beneath the Altiplano-Puna plateau, driven by the intrusion of magma from below, is a fundamental process in the building of continents. "This is giving us a glimpse into the factory where continents get made," Perkins said. "These big magmatic systems form during periods called magmatic flare-ups when lots of melt gets injected into Earth's crust. It's analogous to the process that created the Sierra Nevada 90 million years ago, but we're seeing it now in real time." In addition to Perkins and Finnegan, the coauthors of the paper include Kevin Ward, George Zandt, and Susan Beck at the University of Arizona and Shanaka de Silva at Oregon State University. This research was funded by the National Science Foundation.